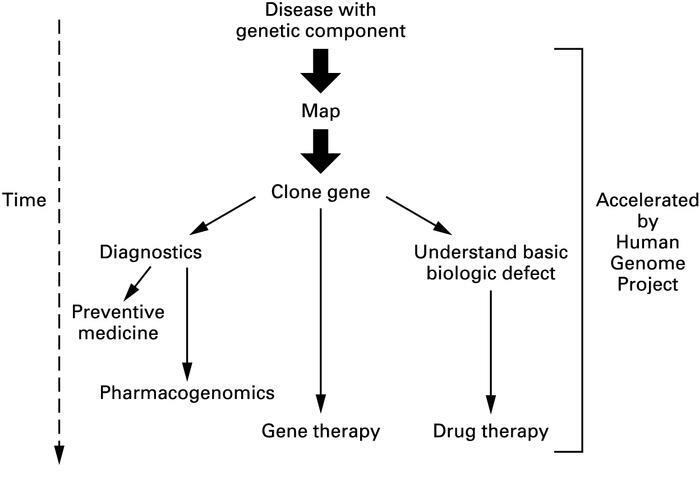 Schematic from 1999 illustrating anticipated advances in medicine that foreshadow personalized or precision medicine. We have highlighted key nodes in this figure to permit us to assess progress over the past 19 years on the six processes that were proposed to be accelerated by the Human Genome Project. Figure reproduced from The New England Journal of Medicine (license no. 4466160787447), Copyright 1999, Massachusetts Medical Society. Reprinted with permission from Massachusetts Medical Society (1).